When Portraiture and History marry, they beget a revolution, or just maybe a Renaissance. In the case of Revolution Mill and portrait artist Suellen McCrary, the offspring includes a rich blend of history, portraiture that breathes life into history, and a little bit of the artist’s soul. Above left: an open office space in the mill today; above, right: Revolution Mill once the world’s largest flannel maker. 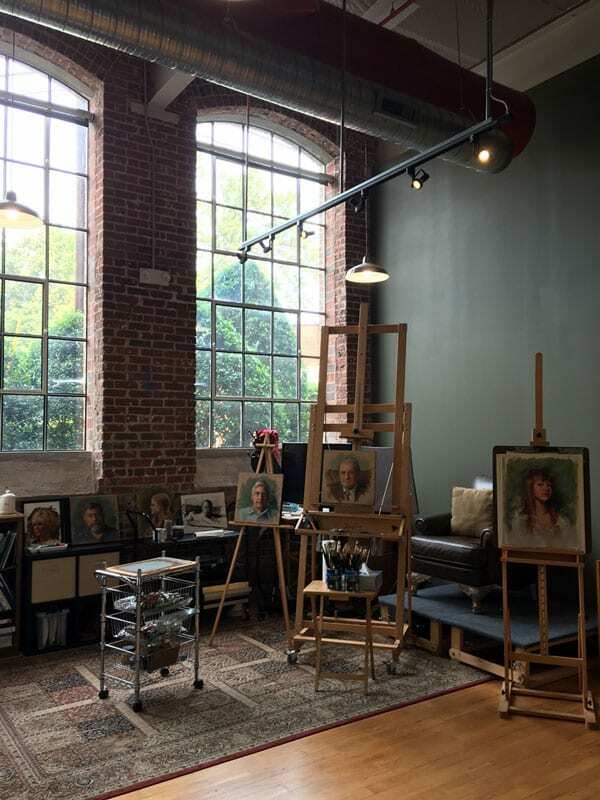 Suellen McCrary’s natural light studio in Revolution Mill. Inspired by Rose Franzen (2), Suellen McCrary created and proposed The Portrait Project to Self-Help. Revolution Mill is a historical site, why not make the history of the Cone Mill families come alive too? So, the project was funded. Suellen will complete a total of twenty-five 16” x 16” portraits on wood panels over a two-year period. Listed on the National Register of Historic Places, the revitalized Revolution Mill houses a permanent exhibit on the history of the Cone Mill Villages, with glass exterior walls facing onto a long hallway, where each portrait will be on permanent display, along with antique mill-working equipment. So far, Suellen has had four subjects volunteer to be painted. Three of them worked in the mill, and one, Dorothy Brewer, who is still active at 101 years old, began working at the mill around 1950 and stayed until the day it closed in 1982. Children of mill employees who lived in the villages while the factory was active are all adults now with children of their own, and several are participating in the portrait project. As the project moves forward, some current residents who live or work at Revolution will also be sitting for portraits. Tying the past and future together, several portraits will be of people involved with the property’s revitalization. Left: Dorothy Brewer, a 101 year old former mill worker, poses for McCrary’s portrait project. Right: after the first alla prima session, the work-in-progress. Ninety percent of the people posing for portraits are not the kind of people who typically can afford to commission a portrait, but they are very much part of the Revolution Mill history. Each subject will receive a giclee of the portrait, and the original painting will be hung as part of the permanent exhibit, their story woven into the history of Cone Mill Villages. Above: Portrait of Ebony. McCrary considers her portraits successful when a little piece of the soul and humanity of her subjects peek out of her work. A successful portrait is more than a likeness of a person. It expresses the artist’s vision and her unique perception of her subjects. Suellen McCrary has a definite style that goes deeper than a likeness to capture strong feelings that express the inner essence of her subjects. McCrary finds faces to be endlessly fascinating, chimeras that shift according to mood. Characterized by use of bold, saturated colors, strong value contrast, wonderful figure rendering, and scrumptious edge work McCrary considers her portraits successful when a little piece of the soul and humanity of her subjects peek out of her work. She pushes the perception of realism into abstraction, while still retaining the emotion and feeling of her subjects. The Portrait Project portraits are begun in one alla prima session, with an additional three to six hours of studio finishing. McCrary lives in High Point, North Carolina, but grew up in Greensboro and currently has her studio at Revolution Mill. Trained as a Graphic Designer, she worked in graphic design for 15 years. She has been painting for 12 years and full-time professionally for three. 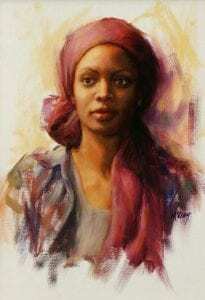 Studying with contemporary portrait masters Scott Burdick, Susan Lyon, Seth Haverkamp, Scott Conary, and Dawn Whitelaw, McCrary has shown and received awards from Portrait Society of America, Salon International, Raymar, and BoldBrush, to mention a few. Suellen McCrary is represented by Tyler, White, and O’Brien Gallery in Greensboro and in collections throughout the United States. See more of her work at https://suellenmccrary.com.